The opportunities that the worldwide web brings to the contemporary business owners and ordinary people grow at a tremendous speed. 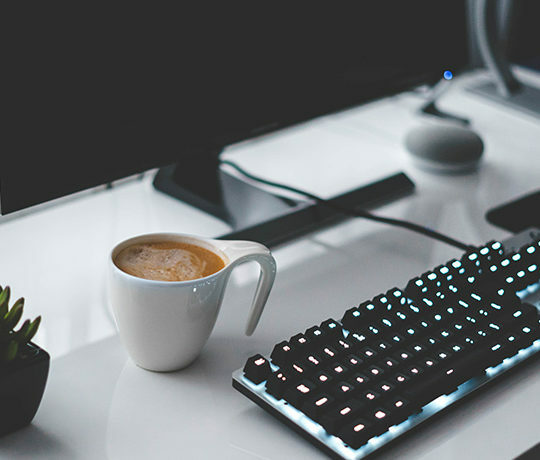 A couple of years ago we even couldn’t have imagined that one day we would be able to build websites without any deep coding and programming skills. Today, even a web design newbie can create sites without someone else’s help. All that he needs is a ready-made website template that is packed full with everything needed for a quick start. 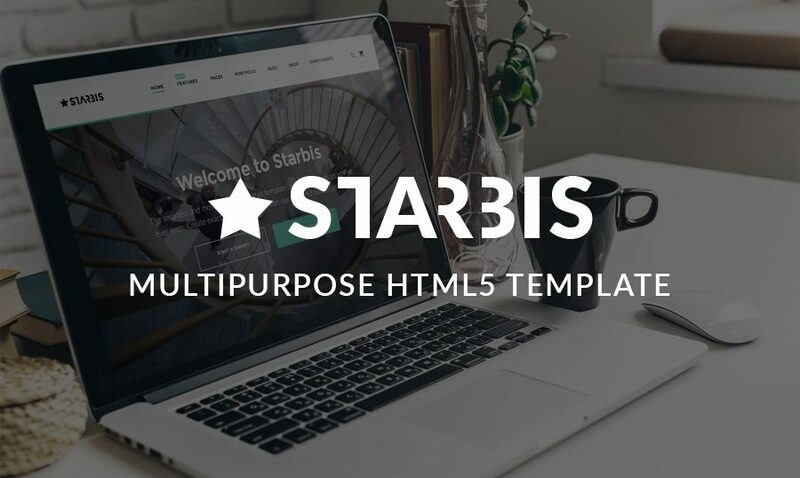 Today, we will be talking about one of such releases from TemplateMonster – Starbis multipurpose HTML5 theme. Starbis is a fit-it-all ready-made template that is intended to be handled equally well by both professional and beginner webmasters. Its extensive set of features allows you to tweak the layout in a way that perfectly matches any business niche and purpose of use. Pre-loaded with a number of custom page templates, its gives you the freedom of bringing your project live out-of-the box. A user-friendly interface and intuitive yet functional admin panel make it possible to introduce your project to the online community in a short run. We will discuss the theme’s peculiarities a little bit later in this post. Let’s start with a general review of Starbis specs. This is a functional, multipurpose theme running on the fully responsive Bootstrap 3 framework. Thanks to its possibility to adjust to a variety of screen sites on the fly, the users who prefer handheld devices with enjoy seamless browsing of your content. The theme is optimized for a top-notch performance in the popular search engines. With the purpose to ensure that Google will give priority to your site and the users will keep coming back, the theme’s elements were optimized for faster loading. 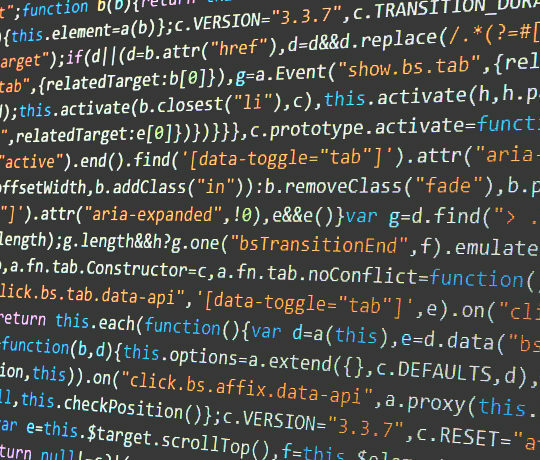 Well-commented code provides clear explanations on what function every block of the template performs, letting webmasters get a clearer understanding of the website structure. All Starbis pages have a well-formatted markup complying with W3C standards. The latter ensures that search engines will index the site’s pages much faster as they are error-free. As we’ve already mentioned in the beginning on this post, Starbis includes a number of pre-designed pages providing for a quick start of your business. You can enhance your site with any of them, upload your own content, fonts, manage the color scheme, and the pages are ready to go straight away. Moreover, all pages boast their unique design. Here are some of them. 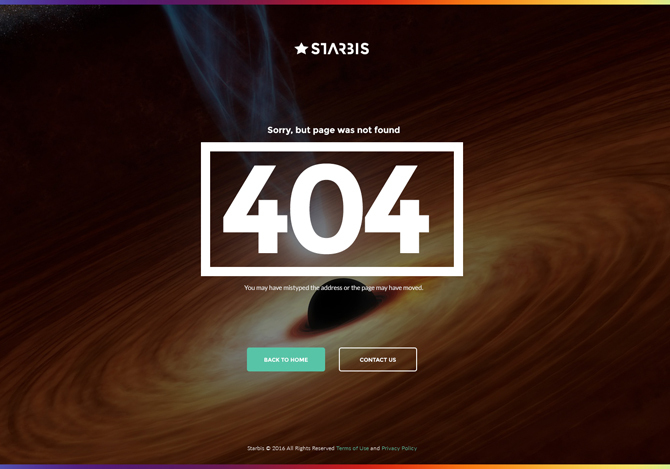 404 Page is intended to reveal to your visitors that they have entered a wrong page address or simply reached a deleted page. It also includes a set of recognizable buttons to get the users back to your site’s homepage. To keep the audience alerted on the upcoming release of a new product or inform them of a new event, there is a Coming Soon Page integrated into the pack. A countdown feature is intended to keep people informed on the time left till the release, whereas a newsletter subscription form will keep them updated via email. User Registration Page is a separate page featuring a minimalist layout, welcoming the users to create a personal account on your site. 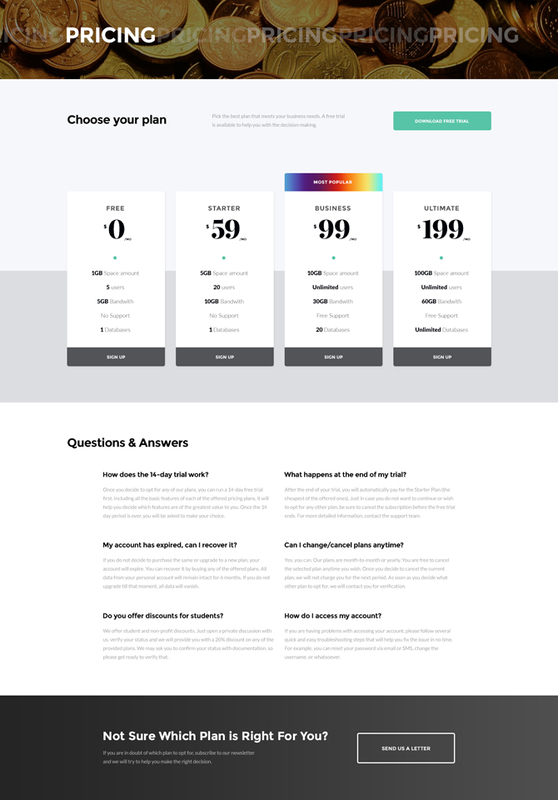 Pricing Page is organized in a simple, quick-to-scan manner. A grid-based organization allows you to showcase all pricing plans in a user-friendly style, letting them compare all offerings and pick the one that matches them the most. 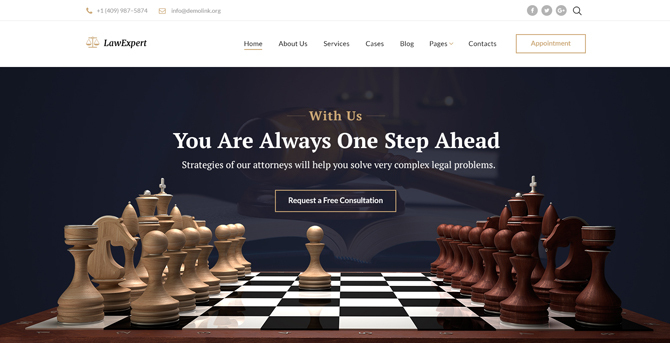 Multiple header and footer layout variations are provided to help you pick the ones that match your site’s look and feel perfectly. You can switch between all of them, try how a minimalist burger menu will look on your site, how a fully-fledged MegaMenu will perform, and whatnot. Starbis is pre-loaded with a number of UI elements intended to enhance the visual presentation of your content, making the pages easy to scan, user-friendly, and more engaging. CTA buttons of multiple sizes and shapes are pre-loaded in the pack. There is also a set of icon lists and boxes providing for better content structurization. Icons are widely recognizable and guide the users’ eye to the necessary content intuitively. There is also a selection of progress bars and counters included to reveal skills and achievements in an easy-to-comprehend style. Starbis is designed to add dynamism to the visual presentation of your content. CSS3 animations and transitions allow you to add motion to the layouts, enhance your site with smooth transition effects, hover effects, etc. Starbis also supports the parallax scrolling animation intended to add a feeling of depth to the design. You website is a great way of establishing a bond with the target audience. This is a place where they can find your contact details, communicate with the fellow users, ask questions, etc. 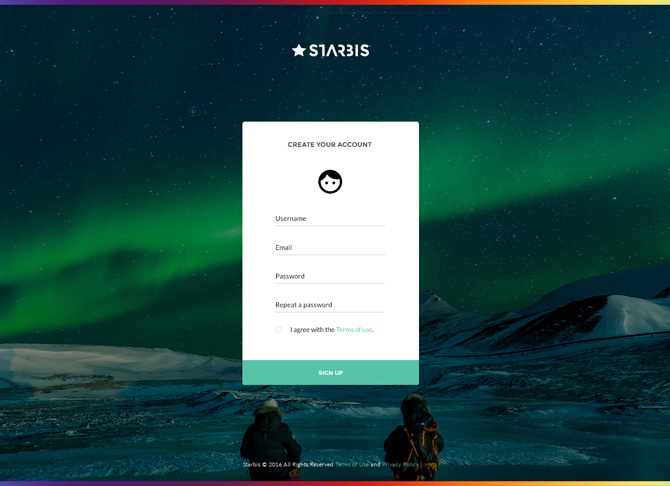 To make is possible to achieve all the aforementioned goals, Starbis is pre-loaded with a set of working forms to interact with people. Thus, it includes a traditional newsletter subscription form, a login form, a feedback form, etc. It also includes a live search form, enhancing your site’s navigation, and welcoming the users to come across the desired piece of content in an instant. 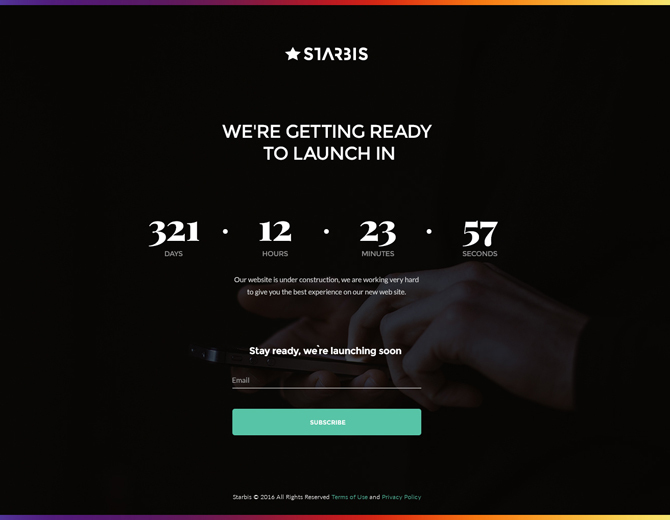 Starbis is intended to become a starting point of a number of web stores. Pre-loaded with all the major eCommerce pages, it is ready to help you start selling products on your site straight away. 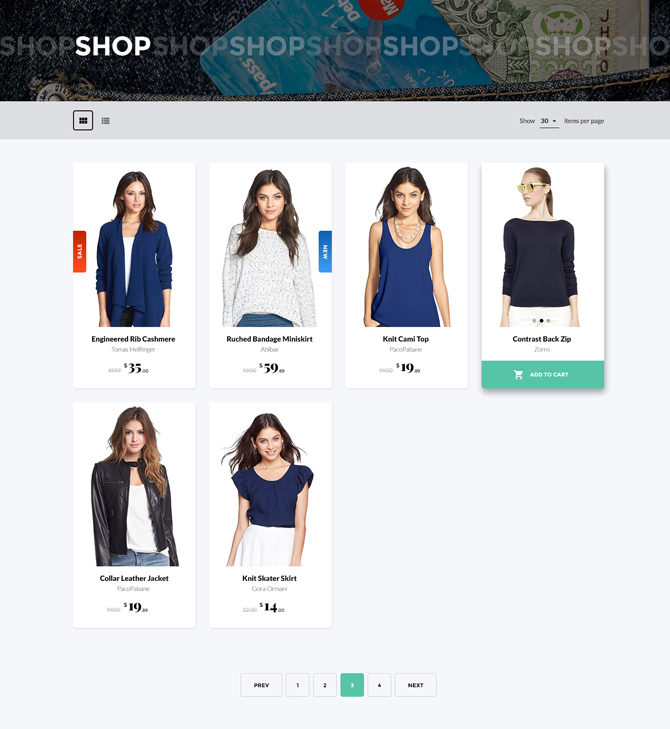 Thus, you can opt for a Grid Shop Layout, making it possible for the web users to choose from grid or list listings. For a seamless navigation of the site’s content, the items can be enhanced with product badges. There is also an option to decide on how many items one wants to be displayed on the page. 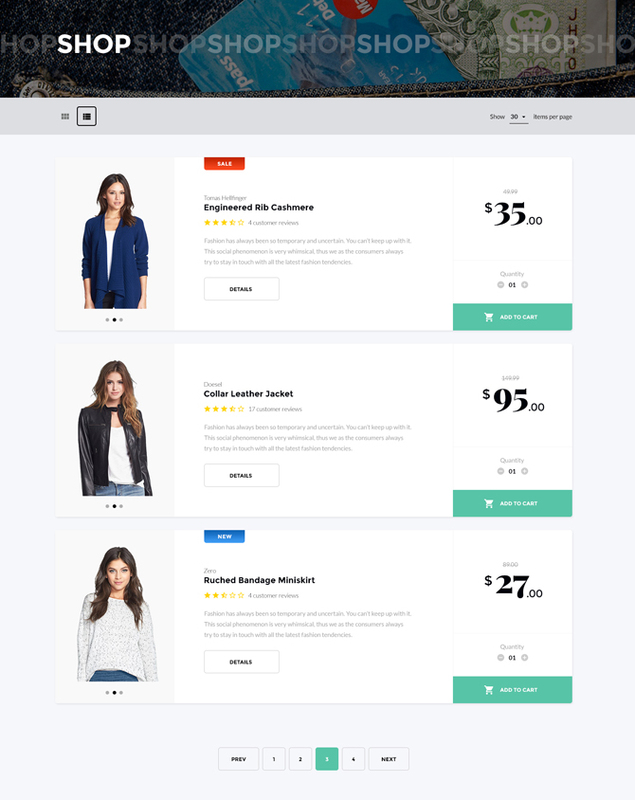 A List Shop Layout provides for a more informative presentation of the site’s content. Short descriptions, star ratings, user reviews, and other data can help your customers with a quicker decision-making. When you navigate to a product page, you will be provided with detailed information about a specific item. Color, size, price, delivery, photo gallery, video review, user testimonials, and other details are organized in an easy-to-scan manner. There is also a built-in widget letting you showcase a list of related items to the shoppers. A Shopping Cart page reveals all items that a person has added to cart. There is also a possibility to increase/decrease the number of chosen items with a click. If a customer decides that he/she doesn’t need a selected item any longer, there is an option to remove it from the shopping cart. 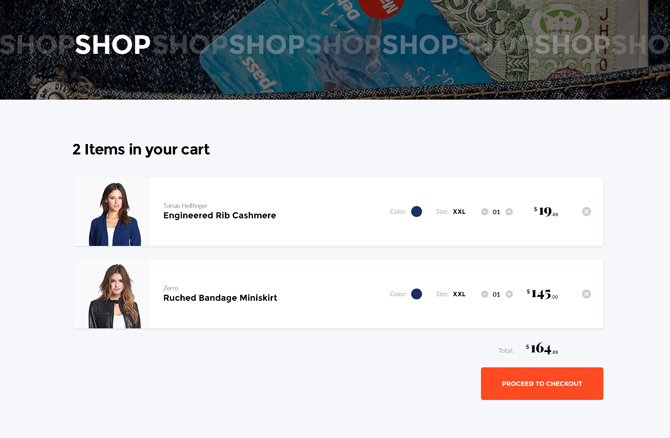 A single-page checkout page is designed in a simple, easy-to-follow manner. This is where the users can fill in shipping and billing details, pick the payment method, and place an order. It’s become a must for every business to have a built-in blog. With its help, you can keep the audience updated on the latest news, provide them with useful information, and simply establish a better contact. Starbis includes several blog layouts that you can choose from. Thus, you can opt for a classic layout to show posts one-by-one. A timeline blog structure will also add a classy look to your site. A grid-based content structure allows you to organize series of blog highlights in an easy-to-scan manner. To bring a modern-looking presentation to your web project, you can opt for a masonry structure. 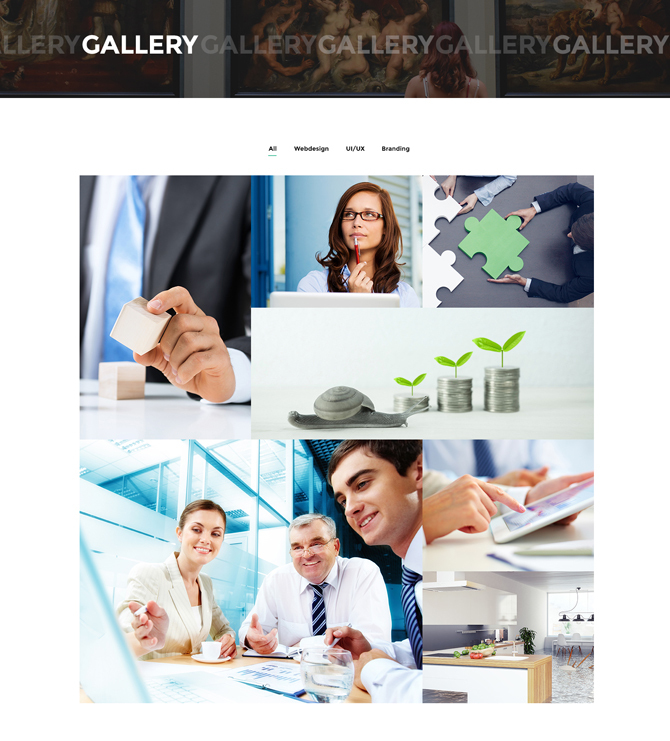 For a more effective presentation of your business projects, Starbis is pre-loaded with several gallery types. Thus, you can organize your works into a classic gallery structure. A masonry type adds a more captivating presentation to the data, letting you combine large and small images on a single page. Anyone looking for a more creative gallery presentation can opt for a cobbles gallery type. Alongside with the main, parent theme, Starbis features a set of child themes suited for different purposes. Below you can find a list of all child themes included in the theme’s pack. TopInvest is a ready-made solution for financial and business purposes. 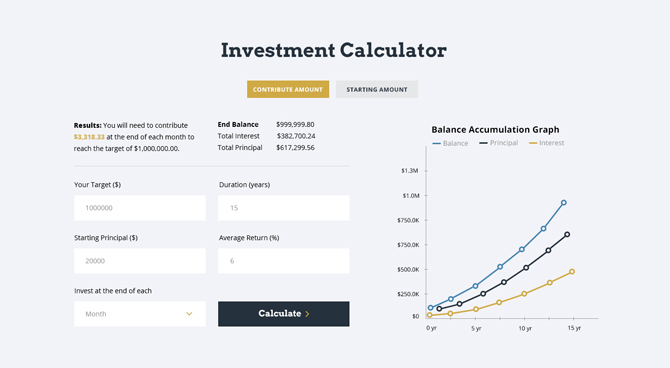 It includes an integrated calculator, letting the users find out how much profit they can gain from their investments. Graphs and chart provide for a more comprehensive presentation of the content. TaxExpert is hand-crafted for accounting businesses. An online tax calculator is provided to let the users calculate taxes based on their area, number of employees, and other criteria. LawExpert is intended to suit the needs of lawyers. There is an integrated booking form welcoming the users to book an appointment on the site. Clear and concise layout provides for a better content comprehension. AllRisk is tailored for insurance company sites. 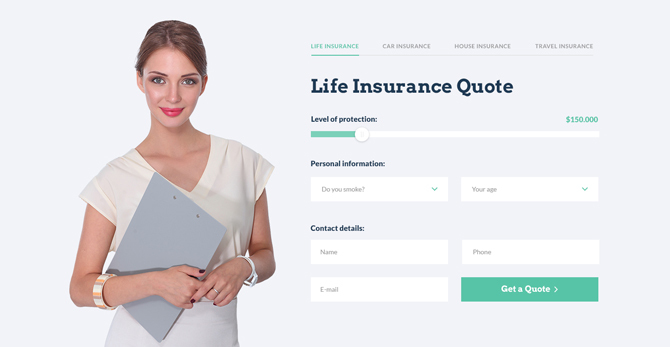 Thanks to a simple and intuitive form for collecting the data from clients, the theme provides the web users with a quick and seamless way of providing the insurance company with all the data required. Here we go. As you see, Starbis includes everything needed to get started with a blog, portfolio or eCommerce site of any level of complexity. A handful of child themes for various purposes are also provided to grow the possibilities of your business. 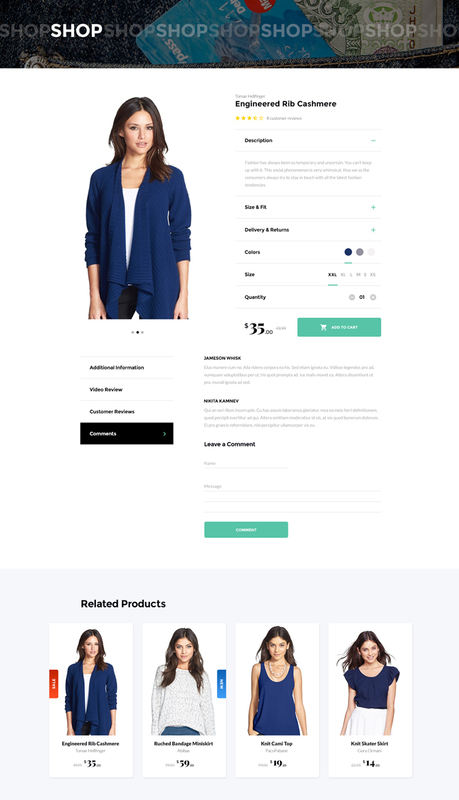 Use any of them, enjoy the benefits of the parent theme, and bring a unique and captivating look to your online business.